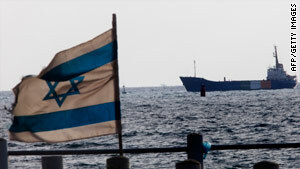 The Gaza aid ship Rachel Corrie enters the military port of Ashdod, Israel, on Saturday. Jerusalem (CNN) -- Arab lawmakers in Israel are receiving death threats in the wake of efforts to break Israel's blockade of Gaza, one Arab member of the Knesset told CNN on Tuesday. "Yesterday I received a recorded phone call, 'a death threat' that we killed a Jewish prime minister and it will be easy to kill you," Ahmad Tibi said. He said the call came from a group calling itself "Pulsa Denura." Named for a curse in the ancient Aramaic language, the shadowy group issued death threats against former Prime Ministers Yitzhak Rabin and Ariel Sharon. Rabin was assassinated in 1995. The group "gave me 180 days to live, and (said to) prepare your will," Tibi said. "I am used to getting such intimidation and threats all year but in the last days it has increased and the type of threats are more serious," Tibi said, adding that they came from "radical Jewish organizations here in Israel and from overseas." The threats came by phone, e-mail, fax and letter, he said. Hanin Zoabi, an Israeli Arab lawmaker who was on the flotilla stopped by an Israeli commando raid last week, has since been verbally abused by other members of the Knesset. TV footage from the parliament showed other lawmakers screaming at her. "The atmosphere is saturated with hatred and anti-Arab feelings in the Knesset and on the street," Tibi said. He has informed Knesset security officers, he said, as protocol dictates. "We are taking these threats seriously, but they will never change my political position," he said. The Knesset is "dealing with the matter," spokesman Giora Pordes told CNN, refusing to elaborate. The Israeli parliament does not comment on security matters, he said, saying any remarks could be used as "intelligence information." Israeli police did not immediately comment on the Tibi's allegations. CNN's Kareem Khadder, Michael Schwartz and Kevin Flower contributed to this report.